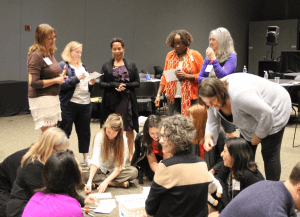 My research examines the social and cultural patterning of learning and language development in communities whose members use multiple languages and participate in multiple learning traditions. I have two overarching goals in studying children’s educational experiences and developmental trajectories as learners and users of multiple languages across contexts: (1) to expand and deepen our understanding of diverse community practices of language use, teaching, and learning and how they vary across time and space and (2) to contribute to the empirical and theoretical bases on which formal and informal education may be made more effective for children learning in an additional language by understanding and drawing upon the repertoires of practice they develop across multiple sites and activities. My research has been funded by the National Science Foundation, the Ford Foundation, the Spencer Foundation, and Fulbright. My current research focuses on informal science learning and dual language learners from diverse cultural and linguistic backgrounds. I have collaborated with with colleagues at COSI, Columbus’ Center of Science and Industry, on the project, ‘Expanding Repertoires of Practice: Improving Informal Science Learning Experiences for Dual Language Learners’, which was supported by an NSF Advancing Informal STEM Learning (AISL) Pathways grant. Our goal is to advance the knowledge and awareness of needs and practices related to informal science programming for preschool children who are learning English as an additional language. 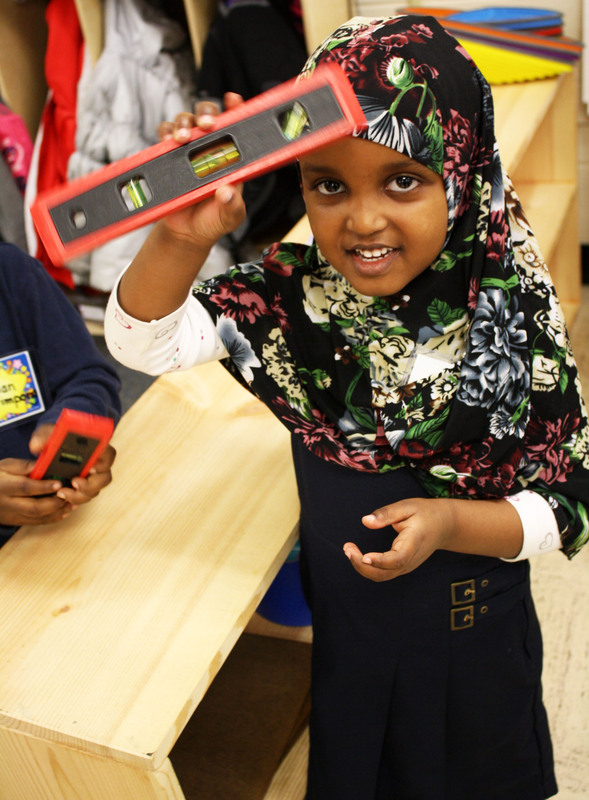 The project brings together my postdoctoral training in informal science education, my work in professional development for informal science educators, and my research with young Somali-American children (see below). It also builds on outreach and engagement work I have been doing at COSI as Educational Director of the Buckeye Language Network Language Pod, a permanent, glass-enclosed research space that provides the public with a research-in-real-time experience. At the Language Pod and in COSI’s little kidspace®, OSU students and faculty engage the public with research and interactive activities that promote excitement about and understanding of language science. For more than a decade and on two continents, I have studied the double schooling – religious and secular education – experiences of Muslim children for whom the language of literacy in both of their schools is not their native language. 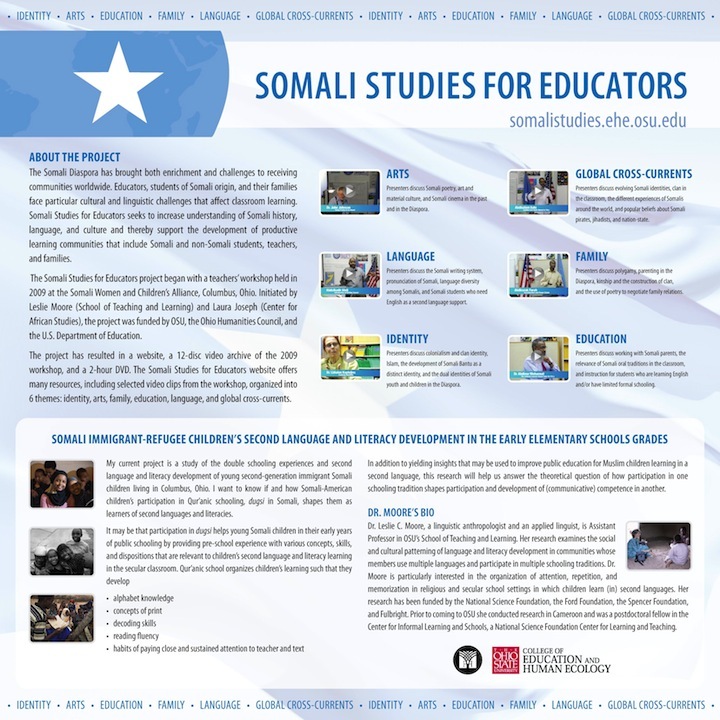 Since coming to OSU, I have been working in the Somali refugee and (im)migrant community in Columbus, examining the schooling experiences and language and literacy development of young children of the Somali Diaspora. My research, outreach, and engagement are intertwined, and an important part of my work has been to communicate and collaborate with Somalis and non-Somalis who want to improve the educational experiences of children of the Somali Diaspora. Two products of this work are the Somali Studies for Educators website and the DVD set Somali History, Language, and Culture: A Workshop. My research in the Somali community builds on my work in Cameroon, where I began working in multilingual communities in 1992. In the Mandara Mountains I studied language learning and use in a multi-ethnic village, identifying several features of montagnard social life that worked together to reproduce and reinforce norms of multilingualism, including patterns of marriage, residence, childcare, and intra- and inter-group communication. 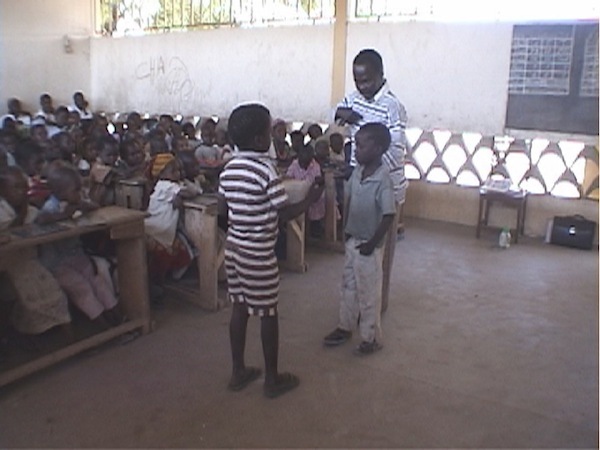 In the capital of the Far North Region, I studied Fulbe children’s socialization into three languages (Fulfulde, Arabic, French) across secular, religious, and domestic activity settings where rote learning was the dominant mode of teaching and learning. On the basis of this work, I developed the concept of guided repetition, reframing rote learning as a complex and context-sensitive practice for teaching and learning that entails much more agency on the part of the novice than has been recognized in most educational research. The guided repetition model can be used as an etic grid to (1) identify patterns in participants’ behavior in rote learning activities; (2) relate these patterns to participants’ goals, expectations, values, and ideologies; (3) track learners’ linguistic and social development; and (4) recognize and understand variation over time and across settings and communities in how these activities are organized. In 2014-2015 I took my sabbatical in the Netherlands, where I was a Fulbright Scholar at Utrecht University. I worked with Professor Mariette de Haan, Endowed Chair in Intercultural Education at Universiteit Utrecht.